Charlie Duhon is the most popular Steel Drum musician (also known as a “Pannist”) based in the North Texas area. Charlie has been performing and recording on the Double Tenor Steel Pans for over 10 years with an average of over 100 live performances a year. With an impressive and ever growing client list, he is the featured entertainment for hotels, resorts, restaurants, water parks and more. Charlie brings a “cruise ship” style of atmosphere to any event with that vacation music feeling of calypso, reggae, soca and popular songs. At an early age, Charlie excelled in both music and art, after getting his degree in Graphic Design and Advertising, continued on with a life long career in Computer Graphics and Fine Art. Also having a musical background consisting of playing the trumpet and bass guitar meant there would always be a deep desire to continue with a music career. 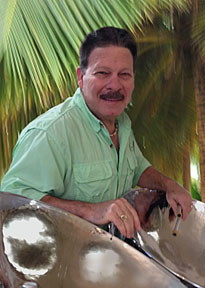 Charlie’s fascination and love for sailing, Jimmy Buffett and everything tropical led to the choice of the unique instruments called the Steel Pans. ​Mostly a self-taught pannist currently focusing on live performances, Charlie often re-arranges his backing tracks and writes some of his own melodies and solos to showcase his unique style. Set lists have some of the expected calypso and soca music, but pleasantly enhanced with a variety of reggae, latin and even some classic rock. Charlie has recorded two CDs, the first was “Beach Party” released in 2012. His latest CD “Hurricane Party” released in 2016 is unique and very entertaining and was featured in a nationwide CBS Radio interview program. And also in 2016, Charlie performed for the reality television program “Little Women of Dallas”. Now finally retired from his graphic arts career, Charlie plans to continue to be a full time musician and is looking forward to recording more as well as giving presentations, lectures and performances on the Steel Pan. With his recently acquired Low C Lead Steel Pan, Charlie hopes to incorporate the new instrument into his act to become one of the few Pannists performing on three Steel Pans. Well, it's like all that and more... Charlie is also an ambassador of the Steel Pan instrument and is dedicated to sharing the history, culture and information about these rare and beautiful sounding instruments. At almost every performance, Charlie usually invites the audience to come up and see, learn and play on his steel drums! It's a hit at every party! What are Charlies' performances like? A lot of people say... "It's just like vacation music!" whether it's a loud festive pool party with high energy soca dance music or some laid back reggae and a Jimmy Buffett style. Charlies' cruise ship style of music is sure to please. Or perhaps a quiet intimate dinner party with soft tropical background music, sounds nice, doesn't it?